The Sri Lankan government on Monday issued certificates, approved by the Sri Lanka Tourism Development Authority (SLTDA), to over 750 tuk tuk drivers in the capital who have been trained as tour guides as well as drivers to local and foreign tourists. Tuk Tuk’s are a popular mode of public transport in the island country with over 1 million tuk tuk’s currently on the streets of Sri Lanka. The “Tourist Friendly Tuk Tuk Program” organised by the SLTDA aims at providing a safer, friendlier and high quality tourism related services to tourists visiting the country. 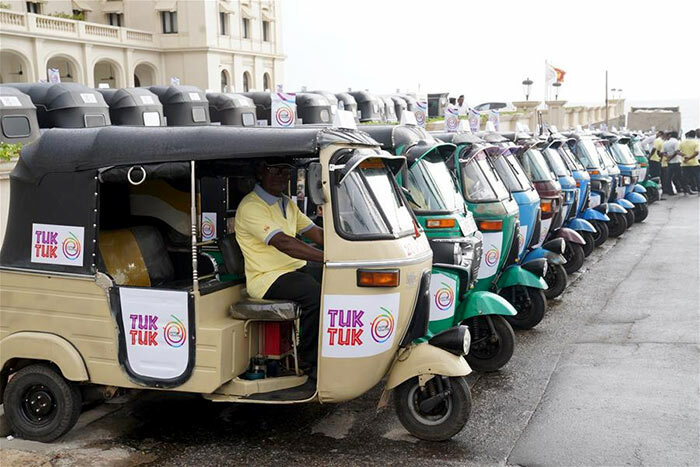 Prime Minister Ranil Wickremesinghe, while speaking at the event held in Galle Face Green, said tuk tuk’s were a popular mode of transportation in Sri Lanka and this program would economically strengthen the tuk tuk drivers. He said any traveler using the public transport would first take into consideration their safety and for this the government was responsible. The prime minister also called on the tuk tuk drivers to learn more foreign languages such as Chinese, Indian, Japanese, German, Arabic, English, among others, in order to provide better services to the tourists. “Even to train them in foreign languages, the government will help them,” the prime minister said. Tourism Minister John Amaratunga said while this program would economically strengthen the tuk tuk industry, it would also be economically beneficial for the island country as tourism was presently one of leading sectors. The Tourist Friendly Tuk Tuk Programme will soon be introduced to other major cities in Sri Lanka and all drivers who have successfully completed the program will receive a special ID from the SLTDA in addition to the Tourist Friendly logo and certification. The logo and branding will allow tourists to easily identify the tourist friendly tuk tuks and obtain their services. Mohamed Nazzar, 59, told Xinhua that he had been driving a tuk tuk for 35 years and while this program would strengthen him financially, it would also allow him to act as a tour guide to his foreign passengers. “I am very happy that such a program was launched. I will now work hard in learning Chinese and English as I have driven a lot of Chinese passengers,” he said.